99 Awesome Dog Facts You Need to Know! Dog lovers know what a blessed life it is, if shared with pooches. From their furry and funny antics to that never lasting playfulness, dogs brighten up everybody’s lives. But there’s more to dogs than just being man’s best friend. They have a marquee place of their own in the animal kingdom, well established by factual evidences. This blog post features 99 dog facts you wouldn’t perhaps have known before! There would be myths debunked, awesomeness dug up and dog facts, divulged! Check out these amazing dog facts and see what we mean! 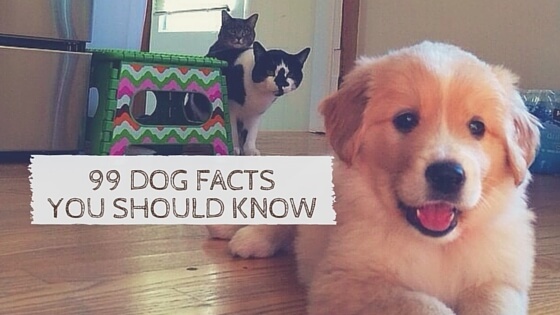 99 Dog Facts You Need to know! Research shows that Dogs are the only animals in the animal kingdom that can read the emotions on your face much like humans. In other words dogs can tell at a glance if we are happy, angry or sad just by looking at our faces! Dogs can see colors! It’s a common misconception that dogs are completely color blind and can only see in black and white. The truth however is that a dog can see colors, only not as vividly as humans. It is akin to our vision at dusk. Dogs can distinguish blue from yellow, but not red from green. The dogs have a higher body temperature than humans. The average body temperature of a dog is 101 to 103 degrees. Dogs are afraid of thunderstorms as these particular sound frequencies can hurt their ears. Unlike humans who sweat through theirs skin, dogs sweat through their paws. A dog’s nose print is unique to that dog. Just as humans can be identified by their fingerprints. Dog’s nose is a thousand times more sensitive than that of a human. The “smell” center of a dog’s brain is 40 times larger than that of a human helping them sniff out drugs, explosives etc. Dogs do dream. Researchers found that dogs have similar sleep patterns and brain activity as humans, and that small breeds tend to dream more than large ones. Psychology Today suggests they’re probably imagining familiar activities like playing outside or chasing their tail. Dogs have their own sign language. Tubby, said to be the world’s greenest dog after entering into the Guinness Book of Records for sniffing out 26,000 plastic bottles and carrying them to his human (Sandra Gilmore) for recycling. The Pink Floyd song ‘Mademoiselle nobs’ features in the soundtrack, a baying dog! In 2014, a seven-year-old Great Pyrenees named Duke was elected as the mayor of a tiny town Cormorant in Minnesota, USA, after all its 12 residents voted for him! The Beatles song, “A day in the Life” has an extra high-pitched whistle, audible only to dogs. Greyhounds are the fastest dogs on earth, with speeds of up to 45 miles per hour! In 1957, the Russian dog Laika became the first to reach outer space. U.S. Customs dogs “Rocky” and “Barco” were so good at patrolling the border that Mexican drug lords put a $300,000 bounty on their heads! Dalmatian puppies are born completely white. The Chihuahua was named after the state in Mexico where they were discovered. George Lucas modeled the Ewoks from Star Wars after his family dog. Dogs are capable of understanding up to 250 words and gestures. The average dog is as intelligent as a two-year-old child. Dogs poop in alignment with Earth’s magnetic field! Ever wondered why dogs kick after relieving themselves? Well, they are using the scent glands on their paws to further mark their territory. The most popular breed of dog in the world (by registered ownership) is the Labrador. We all know about the dogs keen sense of smell – they are capable of differentiating odors in concentrations nearly 100 million times lower than humans can. You can lower your blood pressure just by petting your pup! When your dog spins in a circle before settling down to snuggle, it’s because he’s making himself at home! There are Diabetes detecting dogs who signal their human when they pick up on the special scent that is released when their human’s insulin levels drop. Dogs can be trained to detect changes in the human body — there are even seizure alert dogs that assist patients during the onset of a seizure. Small Pekingese dogs were used as Chinese emperors’ last line of defence. The dogs were hidden in the emperors’ sleeves. The U.S. has the highest dog population in the world — an estimated 62 percent of US homes have dogs i.e. close to 72.9 million homes! Dogs have better night vision/ low-light vision than humans as they have a special light-reflecting layer behind their retina. Small dog like toy poodle dream once in 10 minutes and big dogs dream after about an hour’s gap. Dogs do know Love! Paul Zak, a professor at Claremont Graduate University in California, found that a dog’s brain releases oxytocin – love hormone when it interacts with humans and dogs. Dogs don’t like hugs. In the canine world, putting a limb over other animal is a sign of dominance. There is a building in New Zealand that is dog shaped! After birth, puppies’ eyes do not fully open until they’re about 12 days old. Dogs have 13 blood types while Humans only have 4. Uggie, the dog star of the Oscar winning movie “The Artist” acted so well that it led to an online campaign wherein fans demanded an Oscar for him too! Uggie went on to win the Palm Dog Award at the 2011 Cannes Film Festival, the 2012 Golden Collar Award, and received a special mention at the Prix Lumière Awards, the French equivalent of the Golden Globes. An American Animal Hospital Assoc. poll found that 33% of dog owners admit to talking to their dogs on the phone and leaving answering machine messages for them while away. Only dogs and humans have prostates. All dogs, irrespective of their size are identical in anatomy – 321 bones and 42 permanent teeth. Not all tail wagging is good: a dog’s wag alters based on three moods – when he’s happy, when he’s agitated and when he’s scared. He’s happy when the tail is wagging in its natural position, agitated when it’s high and scared when it’s low. Rin Tin Tin, the famous Hollywood dog signed his movie contracts with a paw print. Gunther III, the pet dog of German Countess Carlotta Liebenstein, inherited roughly 140 million German Marks (about $100 million) upon the Countess’ death in 1991. Of the 12 dogs aboard Titanic, only three survived it. The relationship between humans and dogs as their pets dates back to 12,000 years. The Basenji is the only dog in the world who doesn’t bark. A dog can locate the source of a sound in 6/100th of a second by using its ears like a radar. Dogs can predict an epileptic seizure up to 45 minutes before it happens. Dogs have been reported to sniff out cancers too! A 2009 study by New York professor Alexandra Horowitz found that the ‘guilty dog look’ owners know so well is usually triggered by the dog being scolded by its owner – and is not related to whether the dog has actually misbehaved or not. Currently, there are 339 recognized dog breeds, according to the World Canine Organisation. Dogs curl up while sleeping to protect their vital organs and abdomen from predators. ‘Max’ is the most popular dog name worldwide. Dogs are capable of sensing changes in weather. So, if your dog is acting weird, blame it on an upcoming storm or spell of rain. There are an estimated 525 million dogs on this planet. Dogs have therapeutic capabilities and have been used for therapy since the 1700s. Most dog species have as many as 18 muscles to move, tilt and rotate their ears. As per a US study conducted earlier this year, dogs are actually better than people! Hundreds of pet owners nationwide, preferred their pooch over other well, humans. In Old England, the word “hound” was used to refer to all types of dogs. The are 4 constellations named after dogs – Canis Major, the Greater Dog, Canis Minor, the Lesser Dog, Canes Venatici and Lupus, The Wolf. The brightest star in the night sky is Sirius, aka the Dog Star, and it belongs to the constellation Canis Major. When puppies are first born, they will sleep for around 90% of the time. However, after a few weeks, this will gradually decrease, and fully-grown dogs only need 10 hours of sleep per day. Google is a dog company and actually encourages its employees to bring their dogs with them to the work. Conservationists have used dogs to find bumblebee hives in order to protect endangered species. Ancient Egyptians revered their dogs. When a pet dog would die, the owners shaved off their eyebrows, smeared mud in their hair, and mourned aloud for days. The most dogs ever owned by one person were 5,000 Mastiffs owned by Kublai Khan. French poodles did not originate in France but in Germany. The term “dog days of summer” was coined by the ancient Greeks and Romans to describe the hottest days of summer that coincided with the rising of the Dog Star, Sirius. The ancient religion Zoroastrianism includes in its religious text titled the Zend Avesta a section devoted to the caring of dogs. Touch is the first sense the dog develops. The entire body, including the paws, is covered with touch-sensitive nerve endings. Dogs have lived with humans for over 14,000 years. Cats have lived with people for only 7,000 years. Different smells in the a dog’s urine can tell other dogs whether the dog leaving the message is female or male, old or young, sick or healthy, happy or angry. Countess Karlotta Libenstein of Germany left approximately $106 million to her Alsatin, Gunther III, when she died in 1992. As per psychiatrists, the grief suffered after a pet dog dies can be the same as that experienced after the death of a person. Dogs use ‘whiskers’ as sensing devices; some dogs even use them to see if they’ll be able to fit into small spaces. Unlike humans, dogs do not have an appendix. A dog’s heart beats up to 120 times per minute, nearly 50% faster than a human. Dogs pant to cool themselves off. A panting dog can take 300-400 breaths (compared to his regular 30-40) with very little effort. Dogs chase their tails for a variety of reasons: curiosity, exercise, anxiety, and predatory instinct or, they might have fleas! Maggie, believed to be the world’s oldest dog, passed away while asleep in her basket. She was 30-years-old! Maggie, belonged to Australian dairy farmer, Brian McLaren who didn’t have the necessary paper works to prove the dog’s age. However, as per Guinness World Records, the oldest dog in the world was Bluey who died in 1939 aged 29. Dog’s primal instincts still remain true to their wild cousin, the wolf. Some of these instincts include howling at the moon, pack dependency and even territory marking. An estimated 300 rescue dogs scoured the rubble for signs of life in the aftermath of 9/11 attacks. Roselle, a guide dog, led her blind owner, Michael Hingson, from the 78th story of the North Tower, a staggering 1,463 steps out of the building to the safety. Betsy, a Border Collie has a vocabulary of more than 300 words, knows 15 people by name and can retrieve objects seen in photographs. Territorio de Zaguatas —the Land of the Strays is a dog sanctuary in Costa Rica where nearly 1000 stray dogs live happily in the nature. All of them are vaccinated and cared for. In Nepal, the dogs are worshiped and revered during the annual autumn festival of Kukur Tihar. Whizz, the hero dog who saved 9 Humans – and another dog – from drowning was honored with a posthumous award by the People’s Dispensary for Sick Animals,a U.K.-based veterinary charity, after passing away at the age of 12. In the United States, around 1 million dogs are primary beneficiaries of their owner’s will! So smile and be happy around your pooches, say hello to all those “Max”s and let those nose prints embellish your life with loyalty, love and friendship. Posted on May 5, 2016 May 24, 2017 Author Abhishek JoshiCategories Hail the hound! these facts are so interesting..I have labrador and good to know so much about my pet.. Previous Previous post: Land of the Strays – home to 1000 happy dogs! Next Next post: Wonderful! Airlines break the rule to allow dogs on board!